Manchester City have been reported to Uefa after fans were heard booing the Champions League anthem before their win 2-1 over Sevilla on Wednesday. Match delegate Geir Thorsteinsson, the chairman of the Iceland FA, detailed the incident and disciplinary proceedings have now been opened, with the case set to be heard in November. It is understood Manchester City will not be commenting on the issue. However, the club are expected to defend their fans at the hearing. 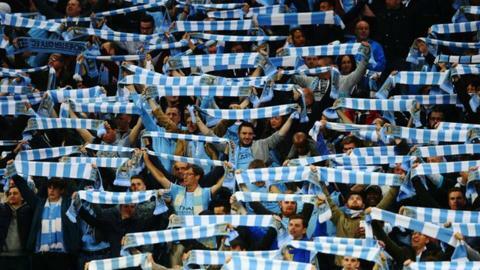 It is not the first time Manchester City supporters have voiced their anger against Uefa. Last year a City fan group led a protest against European football's governing body after 650 CSKA Moscow supporters gained access to the Khimki Arena for their Champions League game, despite the Russian club being ordered to play it behind closed doors. Kevin Parker, general secretary of Manchester City supporters' club, told BBC Radio 5 live: "The City fans have absolutely no love for Uefa, it's clear. "Do Uefa seriously think the threat of sanctions is going to have an impact? Everybody has got a right to a freedom of expression. City fans are just using that right to say we don't like that tune and we don't like Uefa."